In a gripping thriller with a hint of Oliver Twist, a street kid and his dog are chasing an unlikely fortune — and dodging the thugs who would steal it. Twelve-year-old Bully has lost his mum and his old life. Living rough on the streets of London with his dog, Jack, he can’t imagine a future. But one day he finds, tucked inside his most cherished possession—the last birthday card his mother ever gave him—a lottery ticket he bought her. And it’s a winner. A big winner. Suddenly there’s hope, if only he can get to his prize on time! But just as Bully’s prospects open up, peril closes in. Now ruthless gangsters are in hot pursuit, and everyone wants a piece of him. Whom can he trust to help him retrieve what's his? And even if Bully does claim all that money, will he really be winning what he needs most? Michael Byrne's thrill-packed debut delivers the emotionally charged story of a boy whose luck has changed for the better, if only he can survive long enough to claim it. Michael Byrne is an English teacher turned taxi driver who lives with his teenage daughter in Hampshire, England. 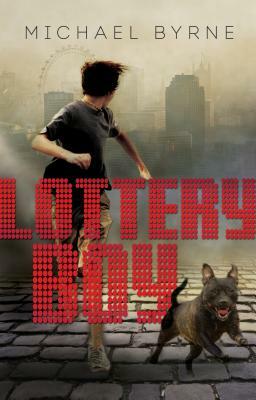 Lottery Boy is his first book for young readers. Occasional kindnesses and acts of genuine compassion soften the impact of the neglect, cruelty, and betrayal Bully negotiates in this gut-wrenching, gripping debut. There's no denying that Byrne can write hard-core action that keeps the pages turning...Boy and dog make a redoubtable, memorable team. An intriguing tale of survival and perseverance that will appeal to fans of Gary Paulsen’s Hatchet and Jerry Spinelli’s Maniac Magee...A stirring, adrenaline-laced tale of endurance that will resonate with young bibliophiles. This first novel is grim and brutal, yet still offers a sliver of hope for Bully and his future. This contemporary fiction is a thriller to the end with strong characterization and nail-biting scenes leading up to Bully’s final achievement: finding a family to love him. English teacher Michael Byrne’s debut title will appeal to readers who love action-packed stories and may particularly appeal to reluctant readers. The urgency of Bully’s plight (underscored by a frequently appearing countdown of the remaining time before the ticket expires) and the suspenseful pursuit by greedy evildoers make this a grip- ping page-turner. Byrne doesn’t shy away from credibly portraying the multitude of hardships faced by a kid on the streets, and lowlife Janks is truly vicious (he not only kidnaps Bully but puts the injured Jack into a dogfight)...Fans of Cottrell Boyce’s Millions (BCCB 7/04) may find similar, if grittier, appeal in this nail-biter.